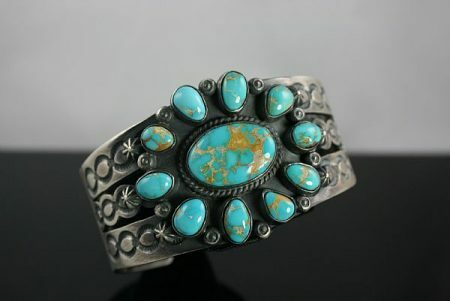 This exciting bracelet is an example of why Roy is famous as one of Hopi Pueblo’s finest master jewelers. 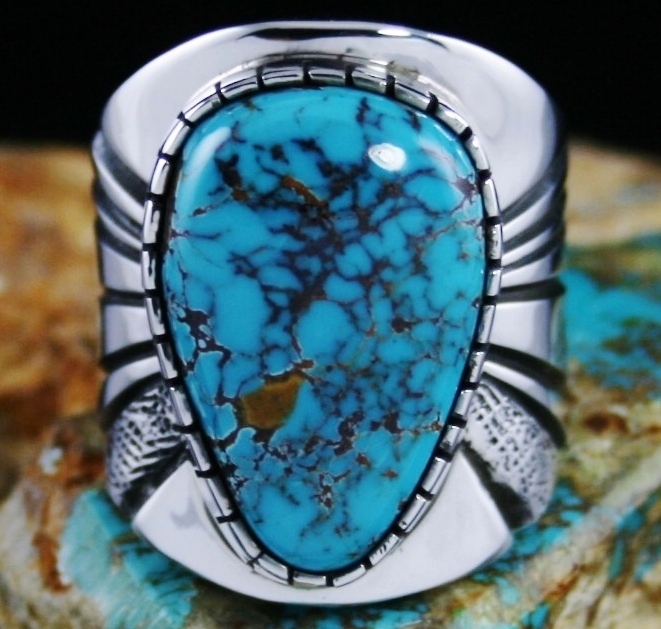 He has set a marvelous gem grade natural red web Candelaria turquoise in a hand chiseled bezel amidst a deeply stamped fan design on either side. 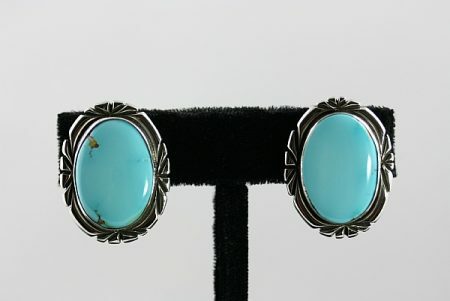 The turquoise is a superb example of the finest quality of the mine. With an incredible amount of depth the cabochon glows with a deep Candelaria blue hue and both red and golden brown spiderweb matrix. The heavy shank is beautifully overlaid. On one side is a corn maiden, the profile gloriously illustrated with fine texture and clean lines. On the other side a stalk of corn, the keystone crop for the pueblo people. Above the corn are rain and cloud symbols. Below is the rising sun that nourishes the crops. 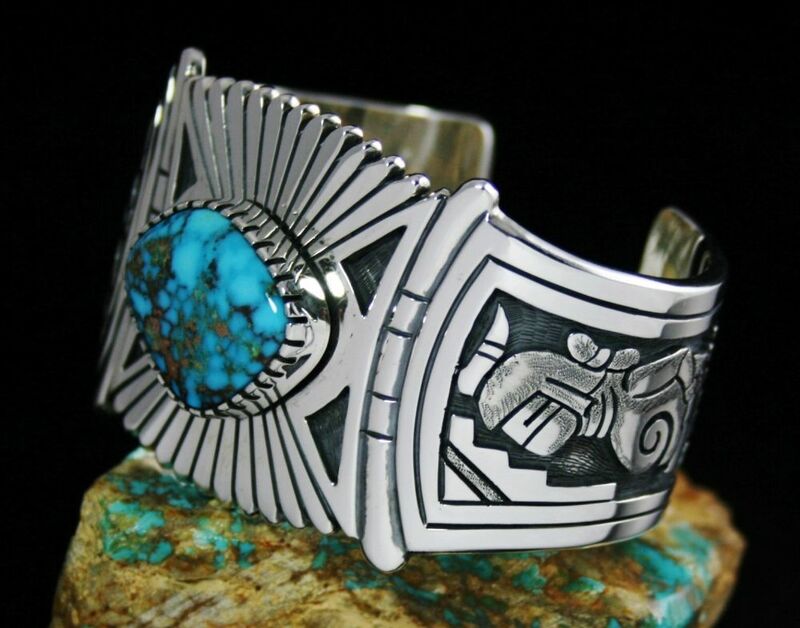 This exceptional one of a kind piece created by award winning Navajo artist, Terry Martinez, features an incredible rare high grade Carico Lake turquoise stone. 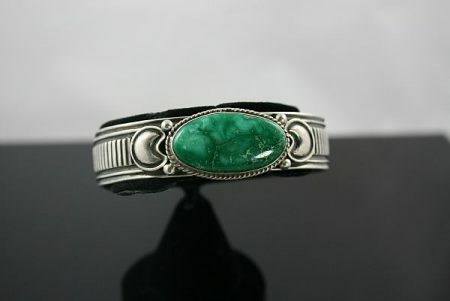 The cabochon is a brilliant lime green surrounded by exquisite detail in hand rolled and hammered ingot sterling silver. Swirls of intricate hand twisted wire are portrayed towards either side of the ring face with elegant sterling silver droplets. 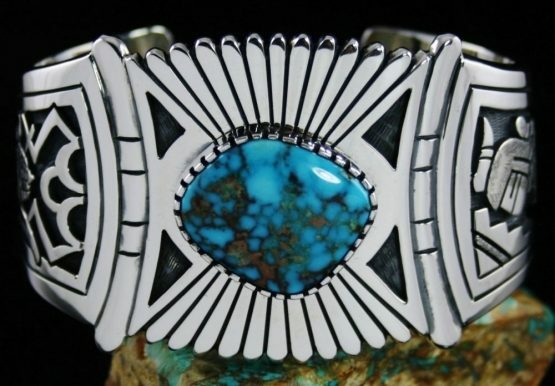 This gorgeous piece created by Navajo artist Victor Hicks features three beautiful Royston turquoise stones that are a stunning light blue. The item also features hand-twisted wire with dark oxidation giving this piece a very traditional look. 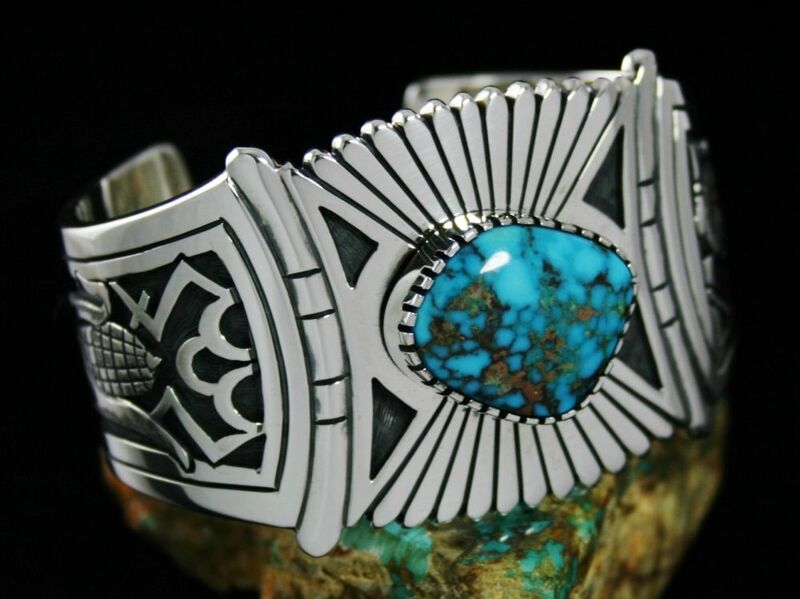 This piece created by Award Winning Navajo artist Terry Martinez features an incredibly gorgeous Carico Lake turquoise cabochon. 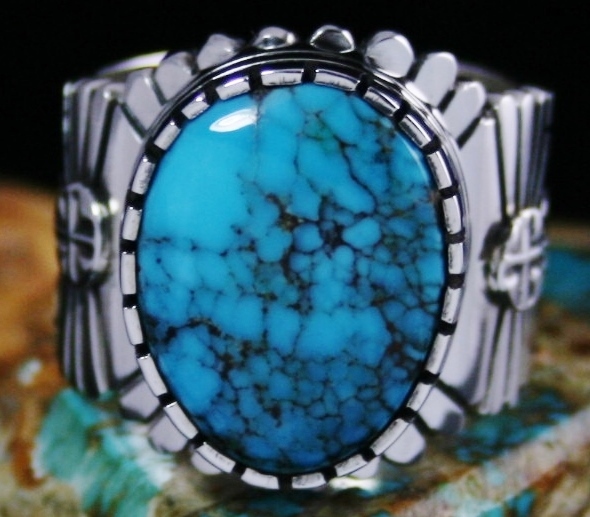 The stone is a beautiful sky blue with thin lines of chocolate brown matrix. 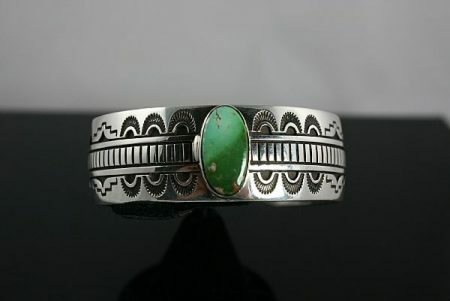 The item includes beautiful traditional silver work, with stampwork on the shank. 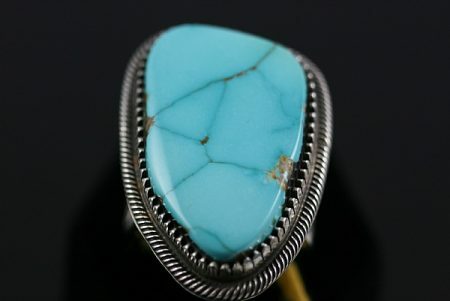 The size of the Carico Lake turquoise specimen in this piece makes it one of a kind. 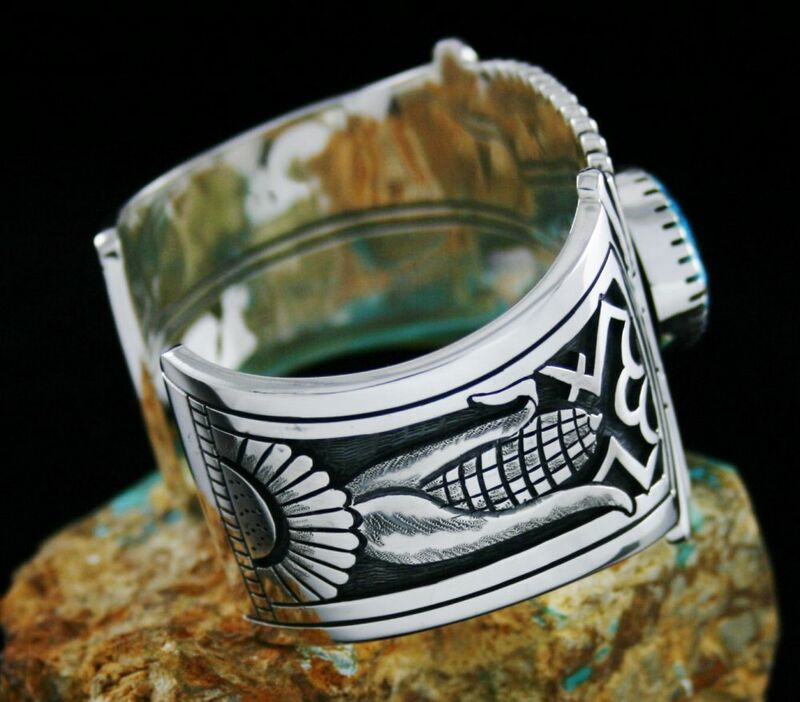 The artist won third place in the Navajo Nations Fair in the ring category with this piece making it very special. 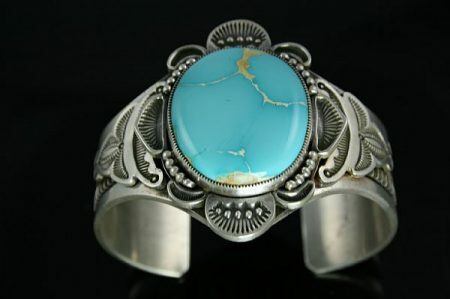 This piece created by award winning Navajo artist Sammie Kescoli Begay features an incredible rare Royal Blue turquoise stone and amazing old Ingot style sterling silver design work. 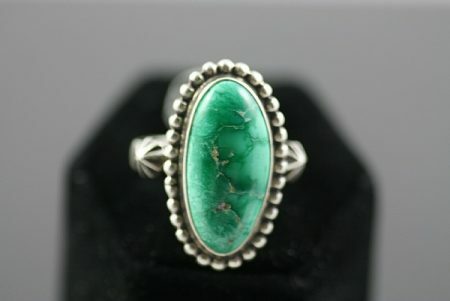 This particular type of turquoise was first mined in the 1930's and has rarely been found since that time. We feel very fortunate to have struck a new pocket. 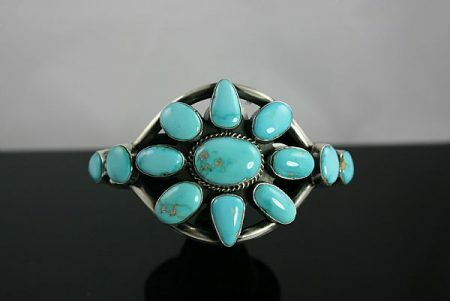 This piece hand fabricated by award winning Navajo artist Leonard Nez features an incredible eleven stone rare Royal Blue turquoise cluster adding a total of 27 cts of Royal Blue turquoise to the piece. 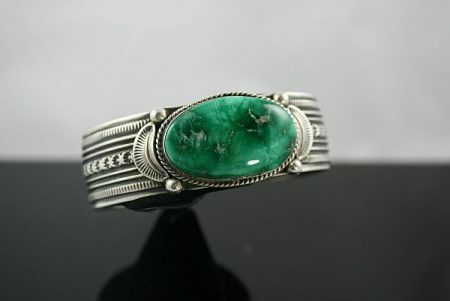 The item also includes amazing traditional silver work with exquisite detail. 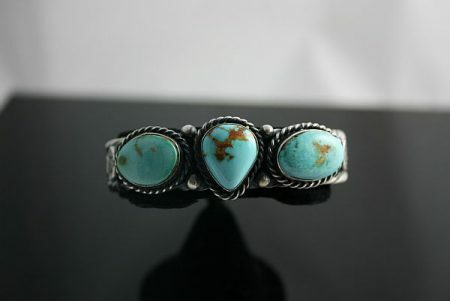 This particular type of turquoise was first mined in the 1930's and has rarely been found since that time. We feel very fortunate to have struck a new pocket. 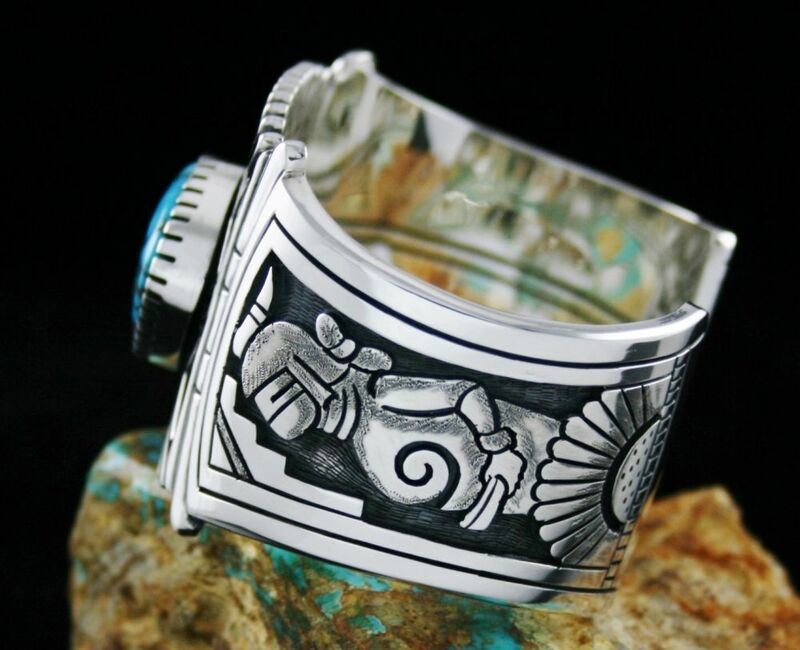 This piece created by award winning Navajo artist Terry Martinez features an incredible Broken Arrow varascite stone and beautiful traditional silverwork. 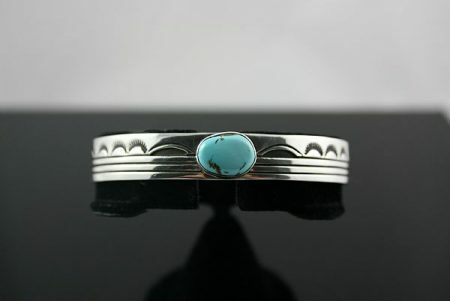 This beautiful piece created by Navajo artist Wilfred Paddock features a gorgeous Royston turquoise stone and incredible contemporary silver work. 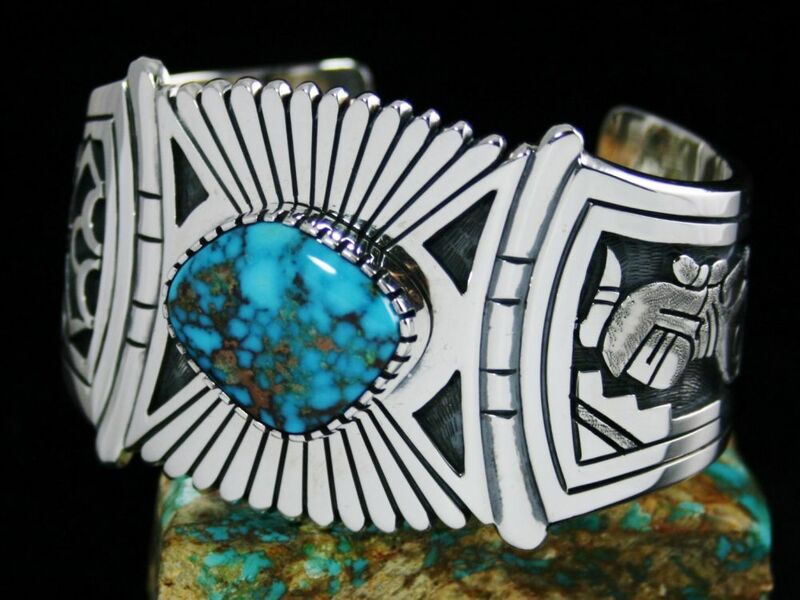 This piece created by Navajo artist Victor Hicks features two incredible rare Royal Blue turquoise stones and beautiful sterling silver design work. 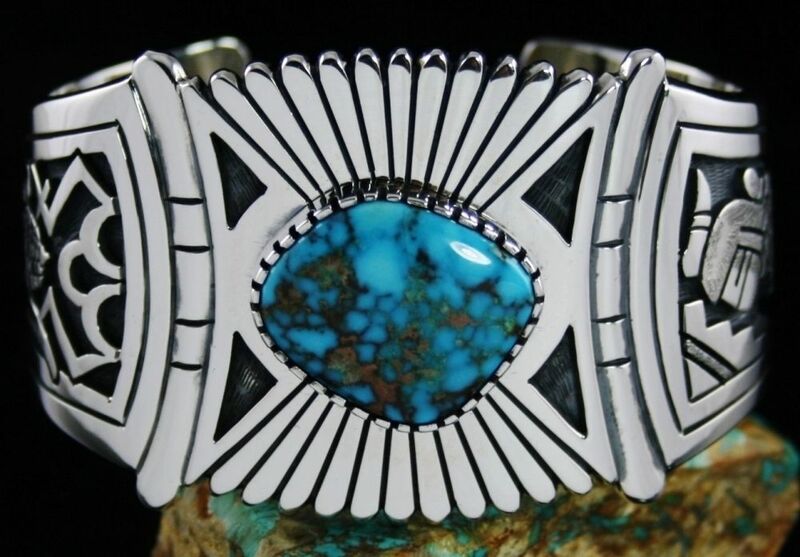 This beautiful piece created by Navajo artist Derrick Gordon features an incredible twelve stone rare Royal Blue turquoise cluster. Each of the stones is a brilliant sky blue. The center stone features golden-brown matrix and a hand-twisted wire design around the bezel. 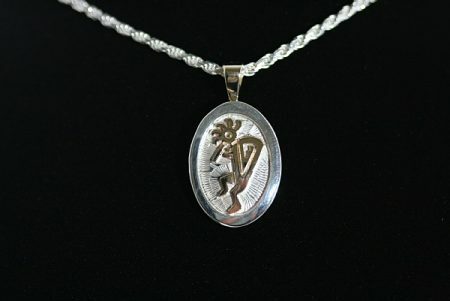 This item also includes beautiful contemporary silver work making this piece highly collectible. 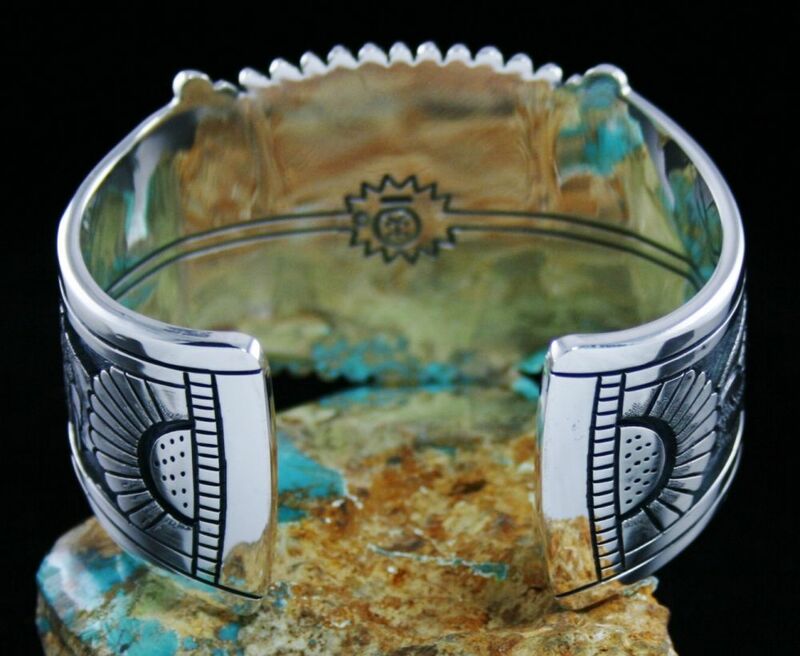 This beautiful piece created by award winning Hopi artist Watson Honanie features an incredible solid 14k gold kokapeli and bale and gorgeous design work in sterling silver. The chain featured with this item is for display purposes only. 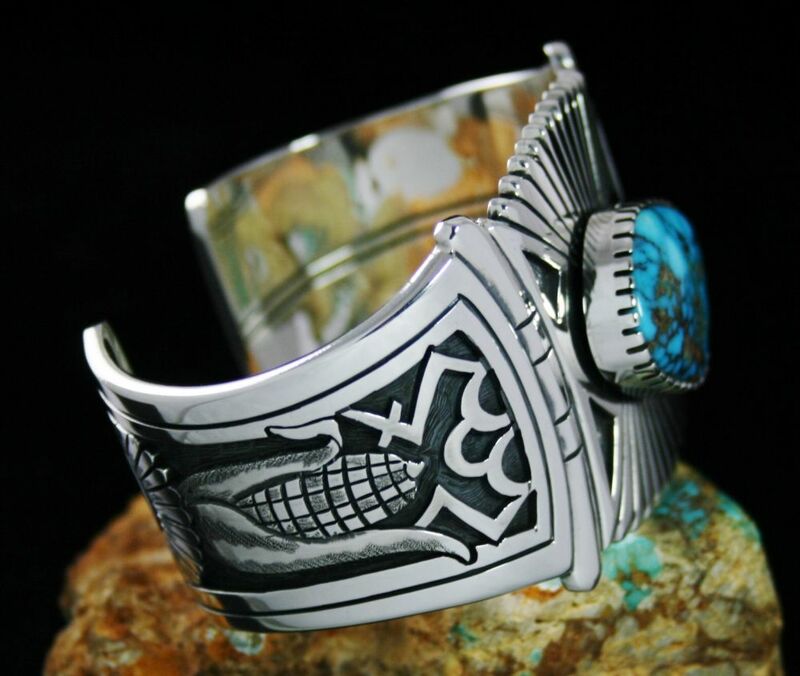 This piece created by Navajo artist Guy Hoskie features a beautiful Broken Arrow varascite stone and stunning traditional stamping and silver work. 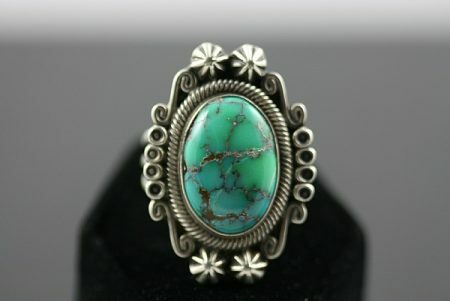 This gorgeous piece created by award winning Navajo artist Charlie John features an amazing beautiful deep green Royston turquoise cabochon. 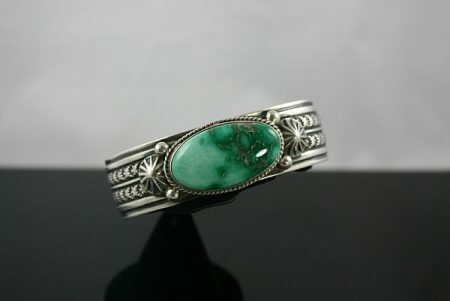 The item also includes incredible contemporary silver work with wonderful deep oxidation and detail. 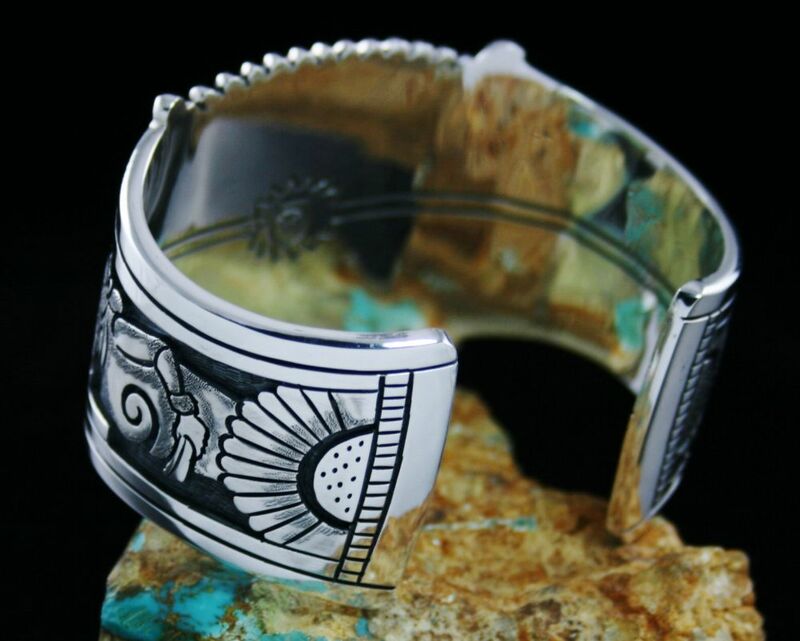 This piece created by award winning Navajo artist Terry Martinez features an incredible rare high grade Carico Lake Turquoise stone and beautiful traditional silverwork. 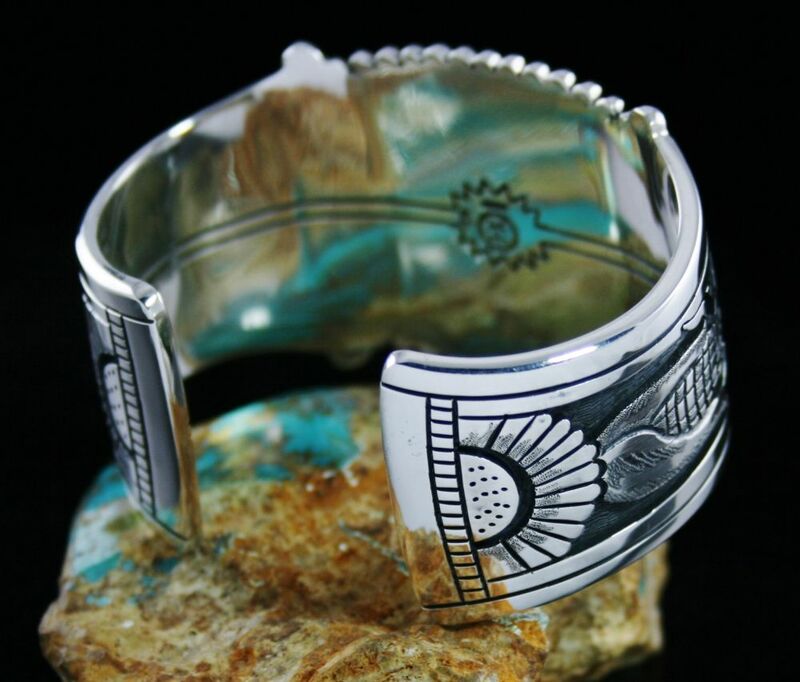 This beautiful piece created by Navajo artist Guy Hoskie features a gorgeous long oval, high domed Broken Arrow varascite stone and beautiful traditional silver work. 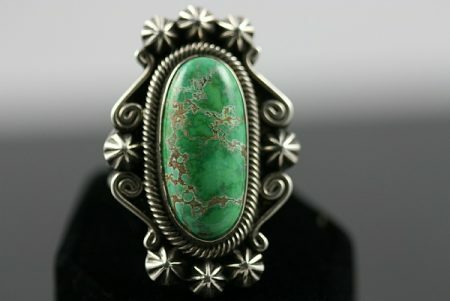 The amazing cabochon found in this piece is a magnificent deep green with tan matrix. There are both light and dark hues of green found in the stone as well. There are many amazing details in the silver work of this phenomenal piece. 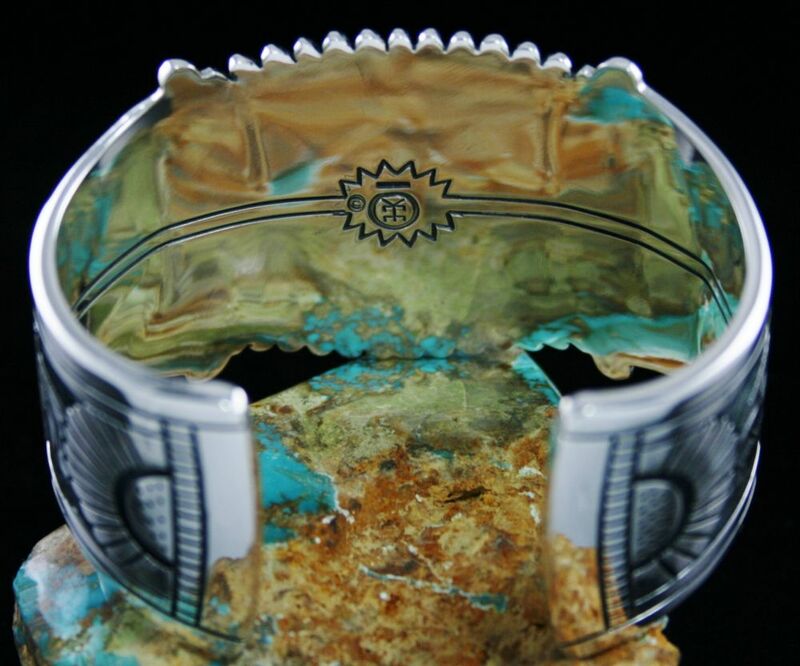 This fantastic piece created by Navajo artist Guy Hoskie features an incredible long oval, high domed Broken Arrow varascite stone and beautiful traditional silver work. The stunning cabochon found in this piece is a fabulous half light green half emerald-green and is truly a wonderful specimen. The stone includes beautiful golden matrix making it exceptional. There are also many intricate designs in the silver work of this one of a kind item.